I may have caused some tension on Saturday when I sent this tweet. In no way was I suggesting we shouldn’t teach writing (or any other subject). But that isn’t why we teach certain subjects. As a phys ed teacher, I don’t anticipate every student playing in the NBA (but I don’t discourage it either!). A well rounded approach to education is the best fit and by today’s standards, coding should be included. Coding (even simple drag and drop blocks) offers more value that most “traditional” methods from a delivery standpoint because these technologies offer a personalized experience with immediate feedback thus freeing up teacher time to consolidate with other students. The simplest “coding” apps are safe environments for kids to take risks and learn from trial and error. In many cases, Geometry is the backbone to the functionality within these programs allowing teachers to spiral curriculum expectations. In education we are always preparing for the next. The next grade, the next school, the next job. While coding has been identified as a employable skill for the future, that isn’t why I want it taught in schools. Not all kids will be professional coders. If we look to the future and follow the trend, we will see less and less syntax in app development. We can leave the “real” programming to those who wish to study it and pursue it as a career. I’m not even sure syntax coding is a necessary skill in elementary school. The real skill is computational thinking. Coding challenges teachers and students to think abstractly. There is plenty of research suggesting a strong spatial sense yields future success in mathematics. Being able to write simple coding instructions and accounting for different variables is like playing chess and visualizing different scenarios. Playing hockey is no different. Goaltenders are constantly assessing the play, changing variables and predicting different outcomes in order to make saves. Computer Science is about moving towards real world applications like design thinking that tie in other subject areas. This form of self expression becomes a medium for storytelling and creativity and less about a math exercise. Let’s go back a few decades and look at photography. Camera folks developed pictures in dark rooms. Today we carry devices in our pockets that take high resolution images and are more powerful than Neil Armstrong’s moon mission spacecraft. Creativity and Computer Science has led to more creativity thanks to tools like Instagram and YouTube. Countless young people are making wealthy livings off of social media and new ideas. While these folks may not be coders, they are known because of someone else’s coding ability combined with their own creativity. Logic is the essence of design thinking. By 2020 we will have more objects connected to the internet than people. For the first time in human history, will have more vehicles connect to the internet than not. Troubleshooting these devices will be as important as changing a flat tire on your vehicle. Combining these devices to efficiently automate your workflow will increase productivity. We live in the era of startups, makerspace and 3D printing where people are becoming entrepreneurs right from their living room thanks to crowdfunding and unique ideas. 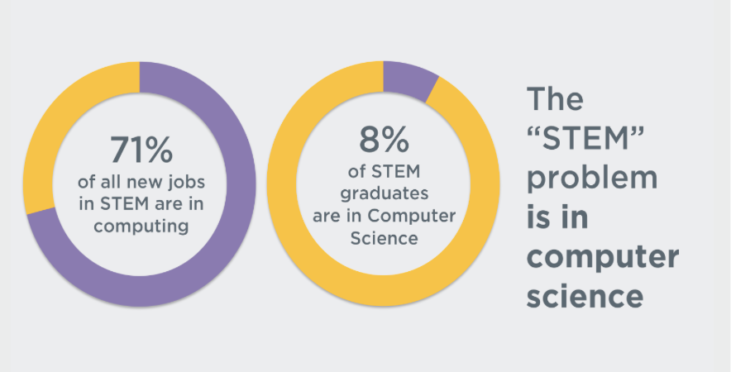 I think it is important to offer coding in schools for a variety reasons, including future employability. While not every kids will be a professional programmer, they won’t know for themselves without first being exposed to it. In reality, it isn’t about coding as much as it is about solving problems. Let’s encourage students to create solutions and not just find them. I am motivated by the countless educators in my PLN who challenge students, inspire them and push them out of their comfort zone. 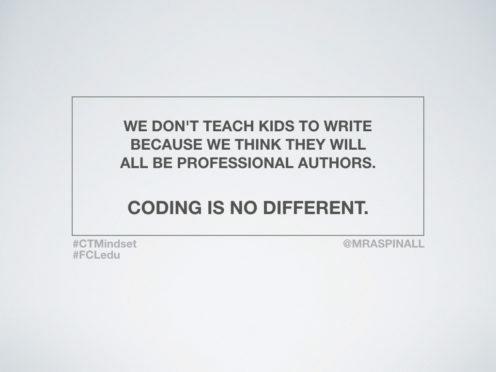 So many are visibly taking risks in their own learning, even with coding. Thank you for exposing your students to it! Lastly, I acknowledge that we can develop rigorous thinkers in any subject area, I would just like coding to be given it’s fair chance. I challenge educators to step back and think about what they teach. Well said. I am using three different coding programs (Osmo, Lightbot, Scratch Jr) with my grade 2/3 class for the past few weeks now and I see so many benefits already. Critical thinking, collaborative problem solving and productive engagement to name a few. I will share some of your thoughts with my parents in my next newsletter. Thank you. I agree with you. I use coding in my class and the kids enjoy it. We use Scratch and several modules from Codecademy. It creates critical thinking and problem solving. It also fosters collaboration in our classroom.